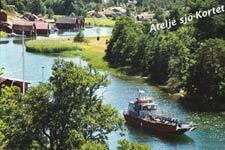 Arkösund is a summer idyll and the gateway to many of the islands. 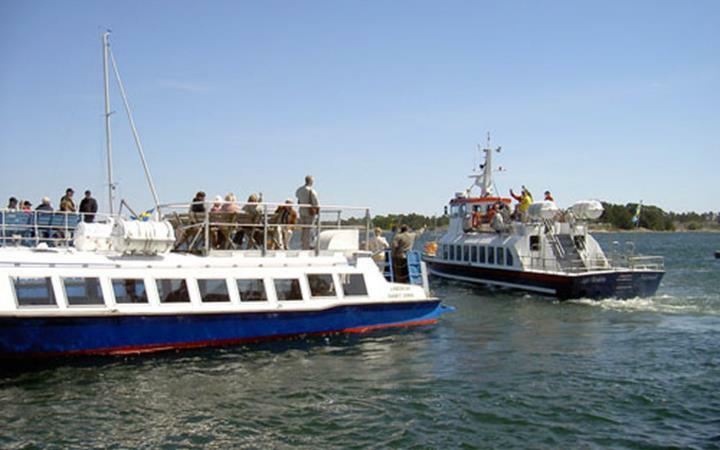 It offers the visitor all manner of services, including guest harbour, camping, swimming areas, restaurants, pub, hotel, shops, chemist, parking facilities, bus 440, boat and car station and much more. During the summer months an open air theatre offers entertainment and there is also handicraft shops, ice cream parlour and two sailing clubs which arrange tournaments and competitions throughout the summer. Cultural walks with information on the best views as well as cultural and historical facts about the region and Arkösund in particular. Handircraft shops in Arkösund – offer a diverse array of local, handmade products as well as home furnishings, clothes, freshly baked bread, bits and pieces for the boat, fishing tackle and local art work. This island, once a pilot station, lies only a 5 minute boat ride from Arkösund. The old pilot station has been renovated and offers conference and overnight facilities used by the Swedish National Maritime Administration. 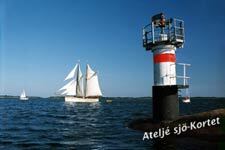 The island of Aspöja offers the visitor experience package holidays. 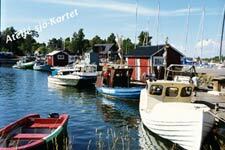 Choose from a day trip or one which includes overnight accommodation and experience the true archipelago atmosphere. Dive into the blue water of the Baltic from sun-drenched cliffs and try your hand at fishing for your dinner! A small archipelago community dating back to 17th century whose inhabitants have, since the 1960’s, made their living by fishing, farming and sea-faring. In order to survive on the islands, it is necessary to be versatile and prepared to turn one’s hand at many diverse jobs as can be seen here. The islanders run a small tourist operation which includes a café for private parties, boat tours etc. 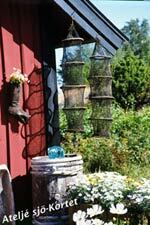 The visitor is very welcome to enjoy strolling amongst the hills, fishing and swimming. This island is easily visited by boat, car or bus and is connected to the mainland by the bridge at Lagnöströmmen. It is a popular leisure area with many holiday facilities including swimming, accommodation, camping, shops, sweet shop, café, parking, pub, local smoked fish, toilet facilities, petrol station, Bus 452, 453 (450, 459). Entertainment on certain evenings at Skärgårdens Camping. pensionat i genuin miljö. S:t Anna skärgårdsmuseum in Tyrislöt is open daily june-august. With a rich fauna with everything from lush oak meadows to cowslip and orchids this is a nice island to visit, Gräsmarö is one of the few islands in this part of the archipelago which still has an active farm with grazing animals. Fine cliffs for bading. The island also has small sandy coves.